It was that time of the year again – winter camp 2017. 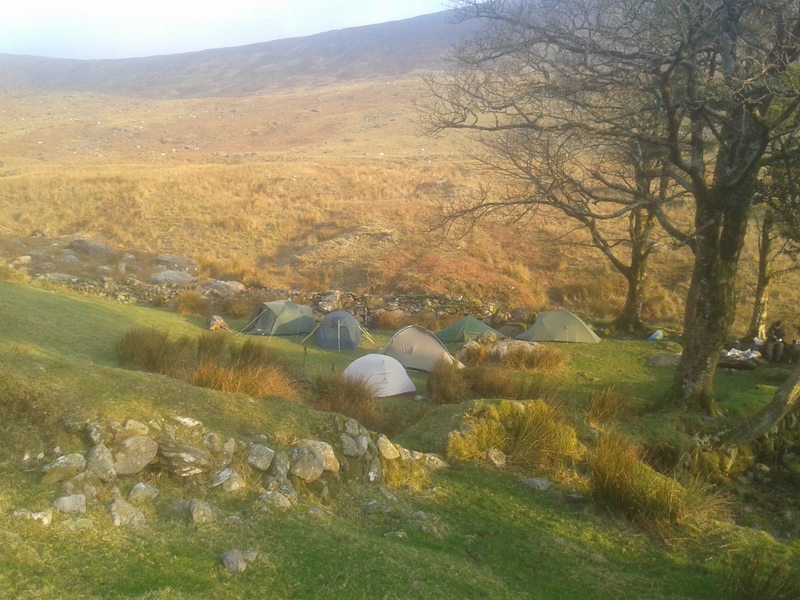 Aodhan worked his usual magic and found a fantastic camp site, nestled in a sheltered valley in the Comeraghs next to a babbling brook, by ruins and under a copse of ancient fir trees. And it was dry. Talk about happy campers! Our Cork city campers included Aodhan and Liz, Pat Speight, and myself (Maureen Fitz). From further afield we had Yvonne (all the way from Durrus), John Paul (from Midleton), John Barry (from Fermoy) and Jim O’Meara (from Cobh). Most of the group met in Dungarvan for an early lunch and set off to park next to a forest path that led into the campsite. As I was delayed, I parked and walked in from near Mahon Falls. As I came over brow of the hill I could see five tents. They looked brilliant, like a little mountain village. Base camp Comeraghs. I joined the group, put up my tent and we organized the site of our leave no trace campfire while discussing where we would go for a little evening walk to whet our appetites for dinner. We set off up to the coom where a string of little lakes mark the source of the River Tay. It wasn’t Banf but it was fairly breathtaking. We made our way back in the dark, torches on, handrailing the stream to the camps site. Pat, who had stayed behind, set himself up as our ‘lighthouse’ in case we needed direction. 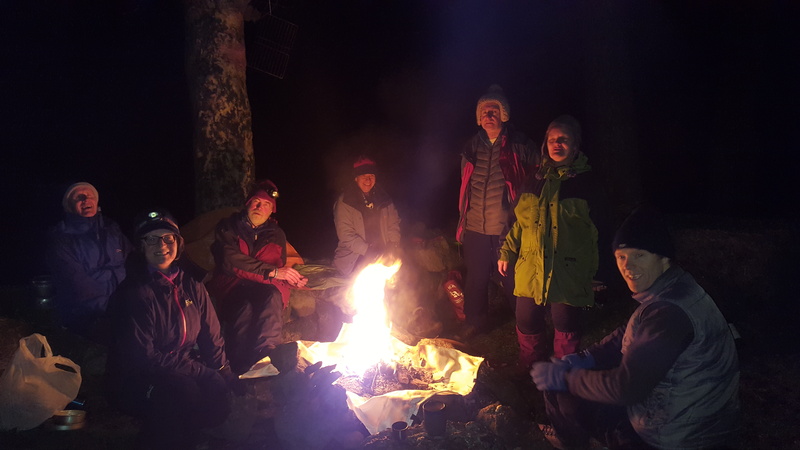 Dinner around the campfire was followed by songs from Aodhan, John Paul and Liz and of course there were stories – some tall tales and some true but all entertaining. When the fire had burned down, we tucked ourselves up into our sleeping bags and woke Sunday morning to sunshine. Cook up time again and after breakfasts that ranged from porridge to boiled eggs and fry ups we packed up camp. A little walk around the top of the coom finished off our day and we headed back along the forest track, already planning and looking forward to next year. Ollie’s recent CMC walk to Crotty’s Lake on the Comeraghs-fabulous photos of November snow on the Comeraghs on Ollie’s recent walk with the happy gang from CMC!